It was a tough year for Florida manatees. At press time in December, the death toll stood at 796—more than double the 2012 total, making 2013 the deadliest year on record. Manatees face a trifecta of troubles: algal blooms, boat strikes and loss of warm-water habitat. This year, a red tide outbreak caused by microscopic algae off Florida’s Gulf Coast—that persisted unusually long—resulted in hundreds of drowning deaths. These plantlike organisms produce a toxin that affects the central nervous system, making it difficult for the animals to lift their heads out of the water to breathe. A different algal bloom on the east side of Florida in the Indian River lagoon killed off much of the manatees’ seagrass food supply. Forced to find different food, well more than 100 animals perished. “While we still don’t know the cause behind these deaths, what we do know is that taking better care of our springs, rivers and watersheds would certainly benefit manatees and many other species,” says Elizabeth Fleming, Defenders’ senior Florida representative. 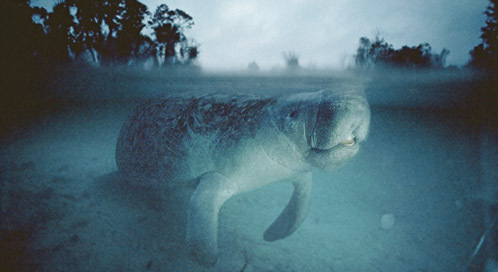 Meanwhile, the greatest long-term threat to manatees is loss of warm-water habitat. Manatees need water temperatures above 68 degrees F to survive. But residential development has greatly reduced the natural, warm-water springs where manatees winter. Nearly 60 percent of the population now depends on outfalls at electric power plants, which means a power plant failure during a cold snap in Florida could wipe out even more of these endangered animals if they’re not able to find another warm refuge. Fatal run-ins with boat hulls and propellers also claimed 64 manatees last year. “This is the No. 1 human-caused reason manatees die, but Defenders is working to make the waters safer for them by creating and expanding protected areas and designating and enforcing speed zones in manatee habitat,” adds Fleming. With only 5,000 of these endangered animals left, every manatee counts. We will soon know the fate of gray wolf management throughout the majority of this country. If the federal government shamefully abandons its conservation responsibilities for this magnificent animal, the battle will surely move on to the federal courts. As the U.S. Fish and Wildlife Service considers abandoning gray wolf recovery across most of the lower 48 states—even eliminating Endangered Species Act protections for wolves in areas where they have yet to be restored or barely have a foothold—recent polls released by Defenders show that the public is against the idea. California eliminates lead in hunting ammo, protecting condors and many other species. Branded America’s favorite fruit, the banana isn’t usually grown in ways favorable for wildlife. Defenders' team helps reintroduce endangered black-footed ferrets to tribal lands in the West. Named for the color of their fat—a result of their exclusively vegetarian diet as adults—green sea turtles come ashore each year to nest as they have done since the age of the dinosaurs. If you were driving a car toward a cliff, would you step on the gas pedal or hit the brakes? Would you try to stop the car or keep driving, thinking that any injury you sustained would be patched up in the hospital later? In the race to save bats affected by the deadly white-nose syndrome, scientists from Michigan Technological University are using chemical “fingerprinting” to identify where bats hung out the previous summer. Big Cypress teems with wildlife and is a refuge for the critically endangered Florida panther. But the roads here make it a dangerous place for the big cats, with vehicle collisions one of the leading causes of death.